Here are some snazzy birthday facts about 9th of June 1984 that no one tells you about. Don’t wait a minute longer and jump in using the content links below. Average read time of 10 minutes. Enjoy! What day was my birthday Jun 9, 1984? June 9, 1984 was a Saturday and it was the 161st day of the year 1984. It was the 23rd Saturday of that year. The next time you can reuse your old 1984 calendar will be in 2040. Both calendars will be exactly the same! This is assuming you are not interested in the dates for Easter and other irregular holidays that are based on a lunisolar calendar. There are 49 days left before your next birthday. You will be 35 years old when that day comes. There have been 12,734 days from the day you were born up to today. If you’ve been sleeping 8 hours daily since birth, then you have slept a total of 4,245 days or 11.62 years. You spent 33% of your life sleeping. Since night and day always follow each other, there were precisely 432 full moons after you were born up to this day. How many of them did you see? The next full moon that you can see will be on May 18 at 21:13:00 GMT – Saturday. Fun stat: Your first one billion seconds (1,000,000,000) happened sometime on February 16, 2016. If a dog named Clancy - a Vizsla breed, was born on the same date as you then it will be 173 dog years old today. A dog’s first human year is equal to 15 dog years. Dogs age differently depending on breed and size. When you reach the age of 6 Clancy will be 42 dog years old. From that point forward a medium-sized dog like Clancy will age 4.5 dog years for every human year. Abbasid Revolution: Abu Muslim Khorasani, Arab military leader, begins an open revolt against Umayyad rule, which is carried out under the sign of the Black Standard. The British schooner Gaspee is burned off the coast of Rhode Island. World War II: Ninety-nine civilians are hanged from lampposts and balconies by German troops in Tulle, France, in reprisal for maquisards attacks. The USS George Washington is launched. It is the first submarine to carry ballistic missiles. The Ghost Train fire at Luna Park Sydney (Australia) kills seven. Thomas Sutherland is kidnapped in Lebanon. He will not be released until 1991. What does my birthday June 9, 1984 mean? Your birthday numbers 6, 9, and 1984 reveal that your Life Path number is 1. It represents initiative, potential and singularity. You are a born leader. You insist on your right to make up your own mind; you demand freedom of thought and action. The following celebrities also have the same life path number: Katherine Webb, Jim Ford, Dean Butler, Jayam Ravi, Neil Cicierega, Nicholas Hoult, Makoto Ogawa, Stiv Bators, Nicola Bryant, Hugh Jackman. 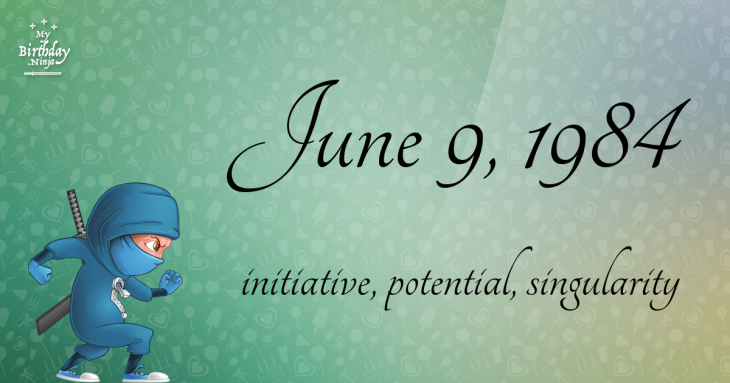 What is the birthday horoscope for Jun 9, 1984? The Western zodiac or sun sign of a person born on June 9 is Gemini ♊ (The Twins) – a mutable sign with Air as Western element. The ruling planet is Mercury – the planet of communication. According to the ancient art of Chinese astrology (or Eastern zodiac), Rat is the mythical animal and Wood is the Eastern element of a person born on June 9, 1984. Fun fact: The birth flower for 9th June 1984 is Rose for devotion. The number-one hit song in the U.S. at the day of your birth was Time After Time by Cyndi Lauper as compiled by Billboard Hot 100 (June 9, 1984). Ask your parents if they know this popular song. How many babies were born on June 9, 1984? Base on the data published by the United Nations Population Division, an estimated 133,872,578 babies were born throughout the world in the year 1984. The estimated number of babies born on 9th June 1984 is 365,772. That’s equivalent to 254 babies every minute. Try to imagine if all of them are crying at the same time. What is the popular baby name on 9 Jun 1984? Here’s a quick list of all the fun birthday facts about June 9, 1984. Celebrities, famous birthdays, historical events, and past life were excluded. 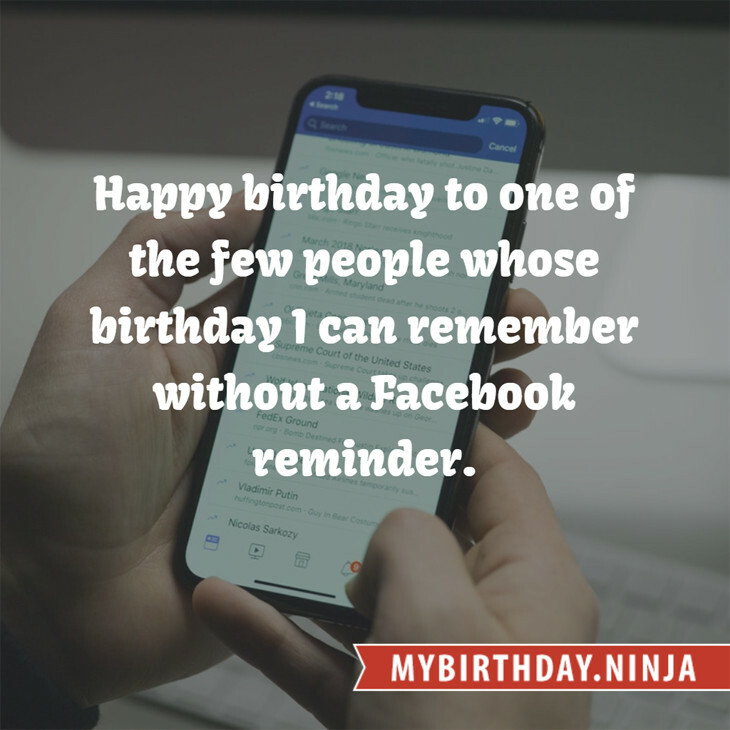 Try another birth date of someone you know or try the birthday of these celebrities: May 24, 1965 – Shinichirō Watanabe, Japanese director, producer, and screenwriter; July 17, 1952 – David Hasselhoff, American actor, singer, and producer; July 19, 1982 – Jared Padalecki, American actor.